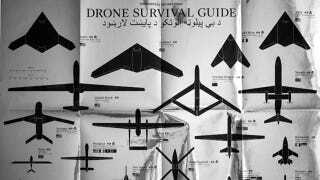 This brilliant Drone Survival Guide contains "the silhouettes of the most common drone species used today and in the near future," each drawn to scale and marked as surveillance or killing machines. You can print it yourself (PDF) or order a folded offset print on Chromolux ALU-E mirrored paper. They claim the guide itself can be used as a defense against drone cameras because of its mirrored surface. Our ancestors could spot natural predators from far by their silhouettes. Are we equally aware of the predators in the present-day? Drones are remote-controlled planes that can be used for anything from surveillance and deadly force, to rescue operations and scientific research. Most drones are used today by military powers for remote-controlled surveillance and attack, and their numbers are growing. The Federal Aviation Administration (FAA) predicted in 2012 that within 20 years there could be as many as 30.000 drones flying over U.S. Soil alone. As robotic birds will become commonplace in the near future, we should be prepared to identify them. This survival guide is an attempt to familiarze ourselves and future generations, with a changing technological environment.